As a companion to my June Bay Area Women’s Journal article on “Faux Bois“, or the fine art of wood graining I am writing this post to further explore the subject. To create, or recreate the look of wood on tired, damaged, or lackluster surfaces is one of my favorite things to do! There are so many uses for even the most simple Faux Bois! Who doesn’t love the warm look of wood in a space? Natural (looking) wood gives a feeling of bringing the outside in. From rustic, to elegant, and back again….go with the grain to enjoy beautiful (painted) wood for all seasons. I would…wouldn’t you? 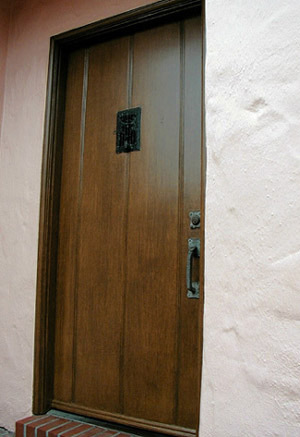 One of the most common uses of Faux Bois is on doors, especially exterior doors. Often these doors are made of wood that has been painted, or has become worn and weather-beaten. Sometimes a homeowner, house painter or contractor will opt to have it refinished in a wood grain finish, rather then replace it, or strip and restore it. As most Faux Bois looks are achieved through the manipulation of semi-transparent glazes over a base coat, the color that emerges is the skillful combination of the two. This also results in a sense of depth, giving the “fake grain” a sense of naturalness. 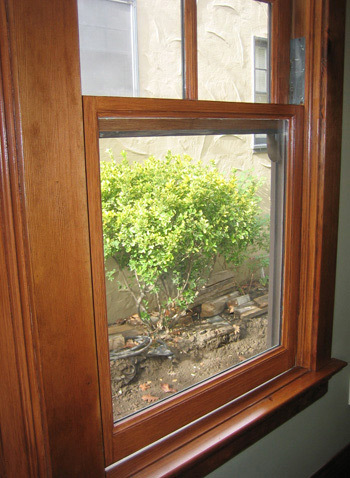 Windows too, are a common surface for Faux Bois. Sometimes, like the above, the sashes have been replaced, and need to be wood grained to match the existing frames and surround. This can be tricky…matching not only color, but “faux” to real wood, but it can be done, and to great effect. And, sometimes, as in the window above, all of the wood areas are done, or redone, at the same time, on the recommendation of an interior designer, architect, or even decorative painter! Ceiling beams can be especially fun, and satisfying to recreate. These beams were initially painted the previous ceiling color, what a waste! The homeowners and their designer wanted them to look like wood again, and to match the heavy, darkly stained wooden doors installed throughout the house. Now they really pop against the creamy ceiling, adding character and interest to the room! Both the cabinet and the mirror frame above are grained to work with the marble vanity top, a great solution for these newly built and installed raw wood pieces. As the treatment is custom, the clients could choose the color, style and feel they wanted, in keeping with the hues in the marble. 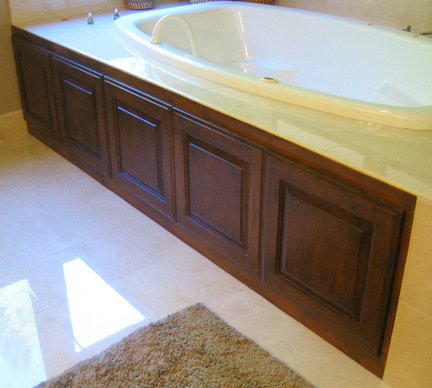 As with any finish, Faux Bois is fine in a bathroom, as long as it is sealed with the proper water-resistant varnish. In the master bath above, the tub cabinets were painted in white latex. Once wood grained, they become a focal point in the room, providing another layer of richness and luxury, and connecting the room to the other wood finishes in the master suite. These cabinets are sealed with an oil-based varnish for extra water-resistance, luster, and depth. The slight ambering of the varnish over time will only add to its warm glow! If carefully planned, and executed with artfulness and skill, Faux Bois, like any finish, will enhance your surroundings, whether interior or exterior. You can have the look of rich, natural or stained wood, without having to strip, restore, or replace. Now, wouldn’t that be grand?! Have YOU used “Faux Bois” in your Home, Business, or Community Spaces? If so, please share about it with us here. We love to hear from you! Remember, we are all designing this thing called Life, together.